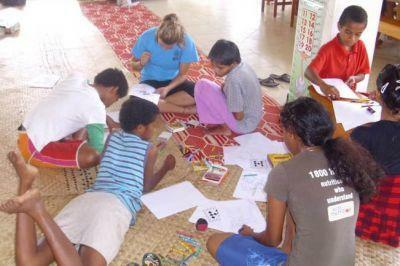 It may be school vacations in Fiji but at one school on the island of Suva, kids just couldn’t keep away. On the final day of the week, volunteers showed off many of the new items they had made and were presented with certificates from the Projects Abroad teaching volunteers. Items included friendship bands, pasta necklaces, dream catchers and other pieces of art. Ms Prescott also added that the head teacher, Sainiana Hickes, was thankful and recognized the contribution the volunteers had made to the students as their connection to the international world.